APC APCRBC105 RBC for SUA2200RMXLI3UХарактеристики Type:Battery module No. of ba..
APC APCRBC106 Replacemen Battery DescriptionReplacement battery cartridgeAPC Rep..
APC APCRBC109 Battery for BR1200LCDI/ BR1500LCDIХарактеристики Type:Battery No. 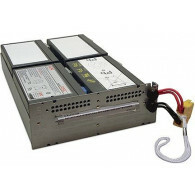 ..
APC APCRBC110 RBC for BE55 0GХарактеристики Type:Battery No. of batteries:1 Batt..
APC APCRBC115 Battery for SMX1500RMI2U/SMX48RMBP2Характеристики Type:Battery mod..
APC APCRBC116 Batt for SMX750I/SMX1000IХарактеристики Type:Battery No. of batter..
APC APCRBC117 Replacement battery pack for APCDescriptionReplacement battery car..
APC APCRBC123 Accumulator for BR900GIDescriptionReplacement Battery Cartridge AP..
APC APCRBC132 Bat. for SMC1500I-2U/SMT1000RMI2Характеристики Type:Battery No. 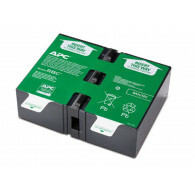 of..
APC APCRBC133 for SMT1500RMI2UХарактеристики Type:Battery Battery capacity:432 V..
APC Battery APCRBC124 to BR1200 / 1500 / SMC1000-2UDescriptionSpare battery pack..
APC BATTERY PACK RT RM 48V SURT48RMXLBPDescriptionBattery systems for Smart-UPSA..
APC Battery replacement kit for SRT 5 kVA,6 kVA,8 kVA, and 10 kVA Партиден номер..
APC BR24BPG Additional battery for BR1500GIDescriptionOn the output: ..
APC RBC17 Battery for BE700/BK650DescriptionRBC17 for BE700/BK650 APC Replacemen..